What is information literacy? Cultural literacy; Library literacy: History, types, and roles; Library literacy: Information sources, classification systems; Ethical literacy: Scholarly communication and the academic code of conduct; Network literacy: database searching; Computer literacy: Computer hardware and software; Network literacy: The Internet and the World Wide Web; Media literacy and visual literacy; Government literacy; Financial literacy; Writing a research paper; Conclusion. 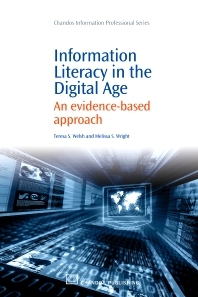 This book examines the various types of literacy that are important in the Digital Age of rapid technological change and proliferating information resources in a variety of formats. According to the American Library Association (www.ala.org), “information literacy is a set of abilities requiring individuals to recognize when information is needed and have the ability to locate, evaluate, and use effectively the needed information.” Information literacy forms the basis for lifelong learning and is common to all disciplines, to all learning environments, and to all levels of education. Information literacy is an umbrella term that includes a variety of specific competencies: cultural literacy, library literacy, computer literacy, network literacy, and media literacy. Each topic addressed in the book includes contextual background information, basic concepts, a resource list, exercises and activities to reinforce the important learning concepts addressed in each chapter. Dr. Teresa S. Welsh is an Assistant Professor at the University of Southern Mississippi School of Library and Information Science. Ms. Melissa S Wright is a doctoral student in the University of Southern Mississippi Department of Adult Education.